When people are evaluating mobile printing solutions, one of the options is to buy a new printer. If you already use a printer (even if it’s not AirPrint capable) it cannot receive print jobs from your iOS device. FingerPrint by Collobos addresses this problem. The application finds your printers automatically and makes them available to your iOS devices. Consider a network with an attached printer and an iOS-Device in the same network. Install FingerPrint on a Mac or PC connected to this network. For your iOS-Device no further action is needed that means no special app has to be installed. FingerPrint finds all network attached printers automatically and they can be selected on the iOS-Device the SELECT PRINTER dialog of every app which supports printing. This image shows the situation after selecting ‘Open On My PC’ in the printer dialog of the iOS app (e.g. printing from Apple’s presentation app Keynote). Whenever an app features the PRINT button you can choose any of your printers attached to the same network. 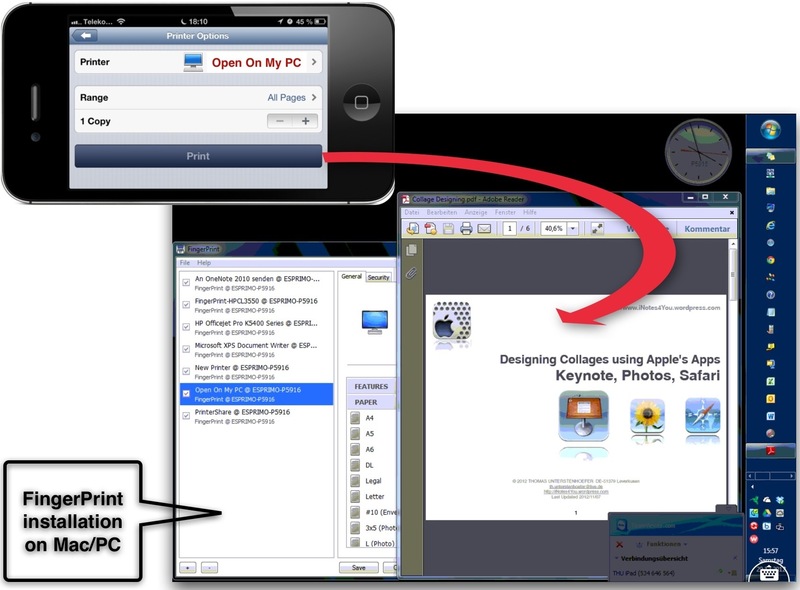 ‘Open On My PC’ will open a document stored on your iOS-Device with the appropriate app on your Mac or Windows PC. Normally we think of printing as sending a document to paper. With Virtual Printers FingerPrint can send documents to locations e.g. Dropbox. To do this a new virtual printer has to be defined just by setting the property ‘Folder’ to the location of a synced Dropbox folder on your desktop computer. The virtual printer is then available in all iOS apps by tapping on PRINT and selecting this virtual printer. The document then is saved to the specified folder and synced with the cloud storage via Dropbox client application. This is very useful for apps which do not support your special cloud provider. iWork cannot directly save to Dropbox because Apple only supports WebDAV access which at the time is not available for Dropbox. As an alternative use iDriveSync (7GB free) which supports WebDAV and even a client for Macs and PCs is available. Previous Post iOS 7 is coming, dead sure!